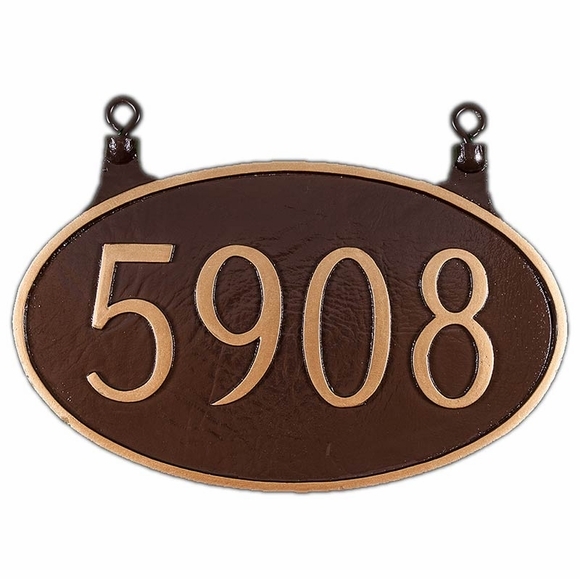 Personalized 2 Sided Hanging House Number Sign - - oval address plaque holds up to five large 4" characters. The same house number appears on both sides. Made in USA. Made with integrated loops for hanging and designed to fit the optional Hanging Sign Bracket shown in Related Products. Custom made with your house numbers and color scheme selection. Q: How far apart are the eye bolts? Very professionally made...Love it! Excellent quality. Would definitely recommend. The double sided number sign is perfect and works well with the bracket. It is large and easy to see both day and night. Beautifully made and well finished. Perfect....We were building a new lamp post and but an extension arm off to the one side and hung this oval number sign on it and it looks great. Well made, nice quality. Great addition to the lantern. Two thumbs up! Arrived w/i time frame; absolutely beautiful; added very nice curb appeal to our home, Will shop here again when another address plaque is needed. The sign is very well made and should last my lifetime. The sign is made of cast aluminum with the steel hanging hardware cast into the top. NIce SIgn, good quality. Took awhile to arrive but customer service was very good when I called concerning deliver.